Fine Art Limited Edition of 50 - Water from the Wenatchee River and its tributaries has been diverted for irrigation since 1891, mainly for orchards. 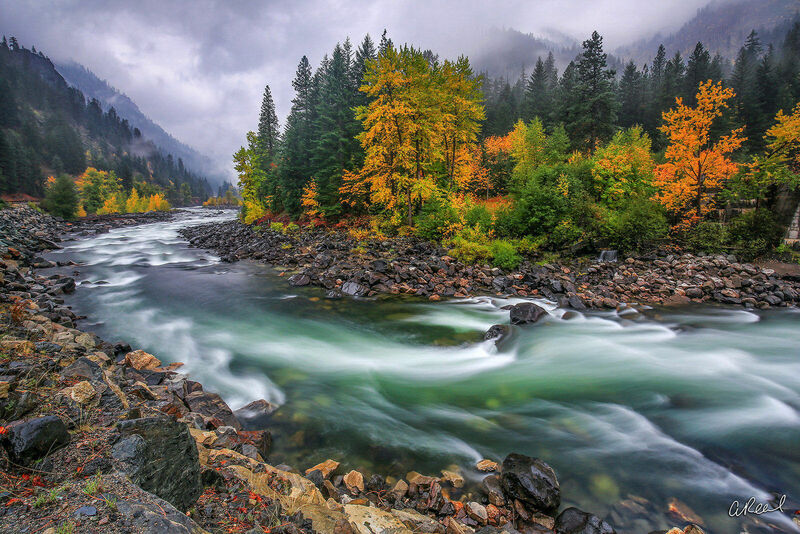 There are two small dams on the Wenatchee River, the Tumwater Canyon Dam, which sits just west of the community of Leavenworth, and the Dryden dam, a low-head dam situated just outside the town of Dryden. The Tumwater Canyon dam originally provided power to the original 2-mile (3.2 km)-long railroad tunnel used near Stevens Pass to get trains across the Cascade Mountains, it was later (starting in 1928) used to power the railroad's electrification from Wenatchee to Skykomish. Related Galleries: Artists Choice | Personal Favorites, Ocean & River Scenic Photography, Risky Business: Is Your Workshop Leader Prepared or Simply Praying?